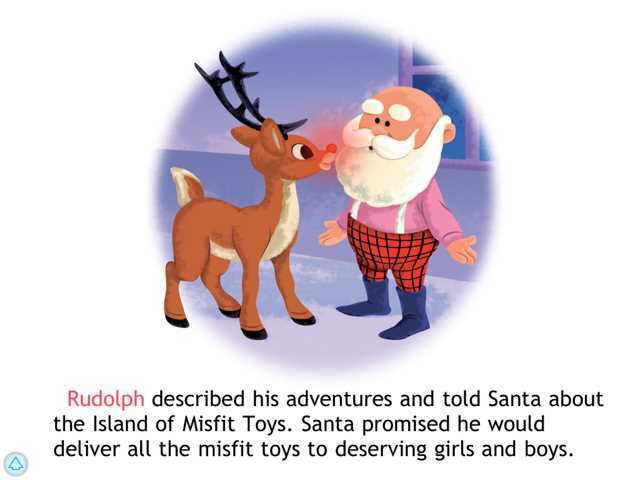 An adventurous version of the Rudolph story that does a great job of teaching acceptance of others. When little Rudolph is born with his bright-red, shiny nose, he is not accepted by the other North Pole reindeer and even Santa is skeptical of his ability to be on this sleigh team. Instead of facing constant rejection, the little reindeer decides to run away. Rudolph meets up with Hermey, a young Santa elf, who is also on the run because he wants to be a dentist and not a toy-maker. In this version of Rudolph the Red-Nosed Reindeer, the duo of Rudolph and Hermey experiences a series of adventures, including running into a scary Abominable Snow Monster, discovering the Island of Misfit Toys, and making friends with an explorer named Yukon Cornelius. Eventually, Rudolph decides that he can't run away from his troubles; so he returns to his family in Christmastown, only to discover that his parents and his friend Clarice have gone missing after they went looking for him. Rudolph finds the search party trapped in Abominable's cave. With the help of Yukon and Hermey, they foil the monster, and all return to the North Pole just in time for blustery Christmas Eve. When Santa sees the bright glow of Rudolph's nose, he asks Rudolph to lead the sleigh so that Santa can see where he is going. 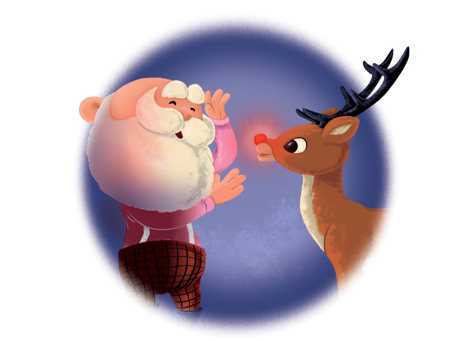 From thereafter, Rudolph is celebrated for being different. Oceanhouse Media is in the process of upgrading some of their book apps to add gentle animations, clever interactivity, and embedded learning games. With Rudolph the Red-Nosed Reindeer, they have upgraded the original version for iOS only (meaning for iPhone, iPod Touch, and iPad). The new iOS version is called Rudolph the Red-Nosed Reindeer - Read & Play. In the settings for the iOS version, parents can control turning off the learning games and the accompanied music and sounds. The Android version, known as Rudolph the Red-Nosed Reindeer doesn't have the learning games. It has little animation and the interactivity is limited to word associations that occur when tapping items on the page. Kids have three choices in how to explore Rudolph the Red-Nosed Reindeer called: "Read to Me," "Read it Myself," or "Auto Play." In the first option, the story is narrated as the words highlight. Kids can touch any word to hear it repeated. 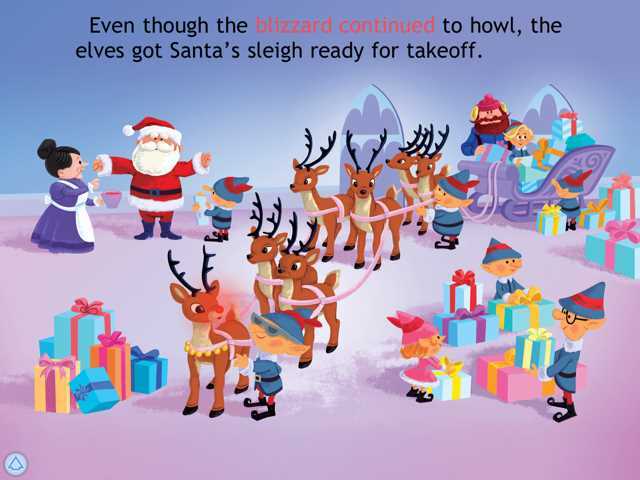 In the Android version, touching the illustrations results in corresponding words appearing; so if your child taps on Santa's boots, the word "boots" will appear. In addition, tapping on a character will frequently result in an audio surprise, such as a comment or a phrase. In the iOS version, touching the illustrations frequently results in an animation. The "Read it Myself" is similar to your child reading a book; and "Auto Play" turns the experience into a movie-like experience as the pages automatically turn while being narrated. The Android version has offers the ability to record your child or someone else's voice reading the story. This story about rejection is a good springboard for parents to talk about accepting others who are different. The story has some scary moments when the Abominable Snow Monster traps Rudolph and his friends and appears to be ready to eat them. I don't particularly like that this story chooses to tame the monster by having the dentist-in-training, Hermey, remove all of Abominable's teeth; but the effect is that the monster becomes sweet, and he is therefore adopted by Santa to work in Christmastown. 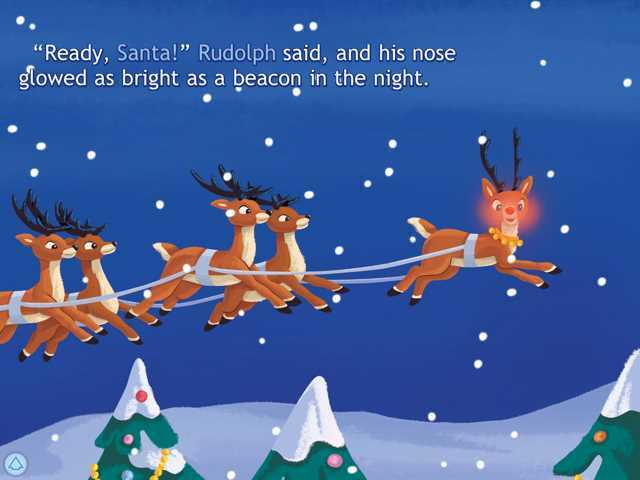 This book app provides enhancement by adding audio surprises and the occasional special effect of falling snow and the glowing of Rudolph's nose. But don't expect animated surprises to popup by touching in the Android version, those are limited to the iOS version. At times, the animations in the iOS version accompanied by sounds seems distracting. If you experience this, use the settings to turn off the music and sound effects. The association of words and objects on the page is a great way to help kids learn to read. We also like the Android version's ability to record the story which can be used by the child, an older sibling, a parent, or even a visiting relative. 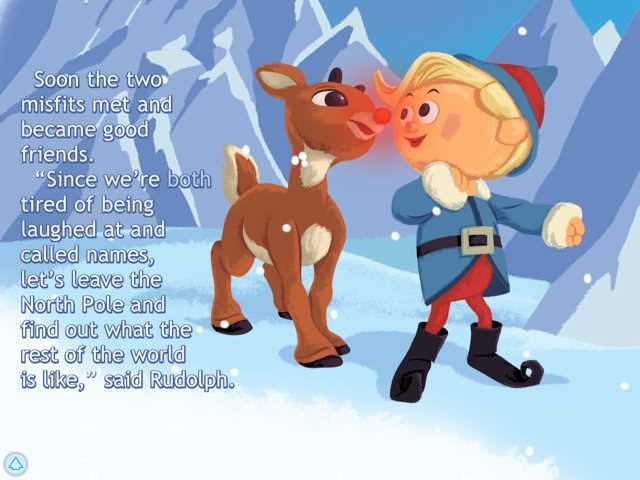 Rudolph the Red-Nosed Reindeer is a fun holiday read, especially for children who love adventure stories. It is also a great way to begin a discussion about diversity and being different.